This post is sponsored by Libby's. 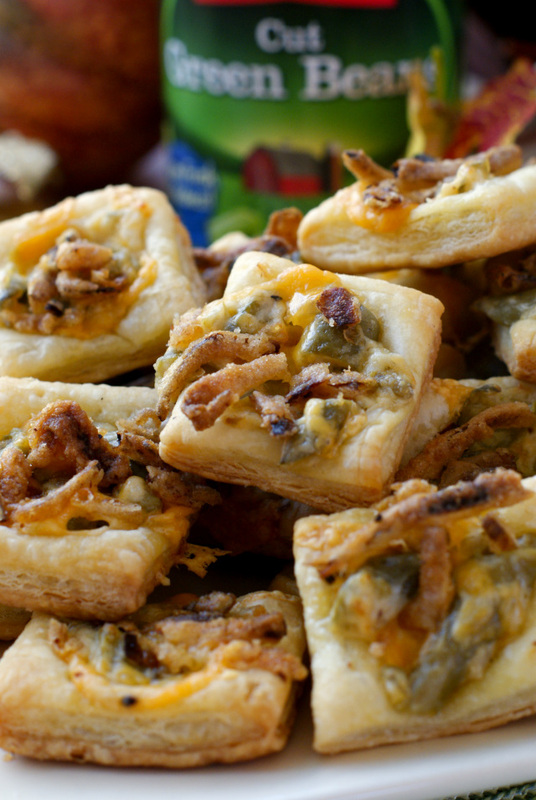 Green Bean Casserole Tartlets transform the classic Thanksgiving side dish into a delicious finger food appetizer that is perfect for the holidays! I adore green bean casserole, don't you? I usually only eat it around Thanksgiving and I look forward to it every year. I would have to say it's my favorite holiday side dish recipe. We have a few people in my family who are anti-mushrooms, so I make a casserole that is sour cream based with onions. Friends, it is so good. I've been meaning to put it on the blog for years now, but every Thanksgiving I'm too busy to take pictures of it, and there's rarely any leftovers for me to try to get a shot of. One of these days I'm going to make a big old dish of green bean casserole just for the blog. Why haven't I done that yet? I'm so silly. I'm going totally going to do it. Stay tuned for that! 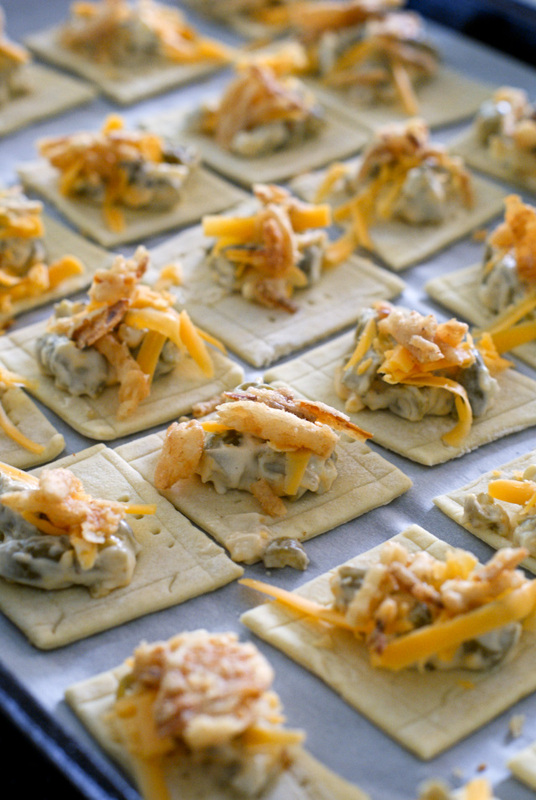 This appetizer recipe celebrates my fave green bean casserole with a fun twist! My friends at Libby's asked me if I'd like to join them in celebrating Cansgiving this year, and I said yes right away! Cansgiving focuses on sharing gratitude this Thanksgiving, whether that’s by spending time with friends and family, honoring decades-old traditions or making new ones. I just love that. Libby’s vegetables are perfect for my family’s Thanksgiving feast and add great flavor, texture and nutrition to not only side dishes, but appetizers like this one, too! Last year for Cansgiving I made my Baked Cream Cheese Corn with Crumbled Bacon and it was a huge hit! Libby’s offers a wide variety of convenient and affordable fruits and vegetables that are perfect when trying to feed a crowd without breaking the bank. This tartlet recipe is only around $0.30 per serving! You can't beat that! If you'd like to join in the Cansgiving fun this year, be sure to enter Libby's Cansgiving Sweepstakes! 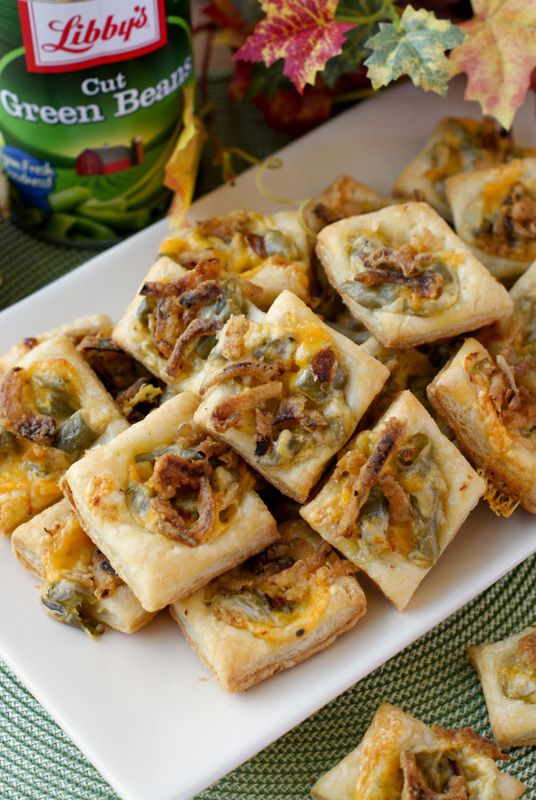 If green bean casserole is your favorite Thanksgiving dish like it is mine, I know you'll love these tasty Green Bean Casserole Tartlets. Good luck to everyone who enters the Cansgiving Sweepstakes, and be sure to follow Libby's on Twitter and Pinterest for more holiday recipe inspiration! On a lightly floured surface, gently roll out each pastry sheet to 10-by-12 inches. Cut each sheet into 30 2-inch squares, ending with a total of 60 squares (a pizza cutter works great for this). Lightly score each square about a 1/8 inch in around the edges and prick liberally with a fork. This will keep the pastry from puffing up too much during cooking. Transfer the pastry squares to 2 parchment-lined baking sheets and put into the refrigerator. Melt the butter in a large skillet over medium heat. Add the onions to the pan and cook for 2 minutes, or until the onions are translucent. Stir in the sugar, flour, salt, and pepper and cook, stirring constantly, for 1 minute. Add the sour cream, green beans, and half of the cheese to the onion mixture and stir until well combined and heated through. Remove from the heat and set aside. Take the pastry squares out of the refrigerator and top each one with a small spoonful of the green bean mixture and shredded cheese. 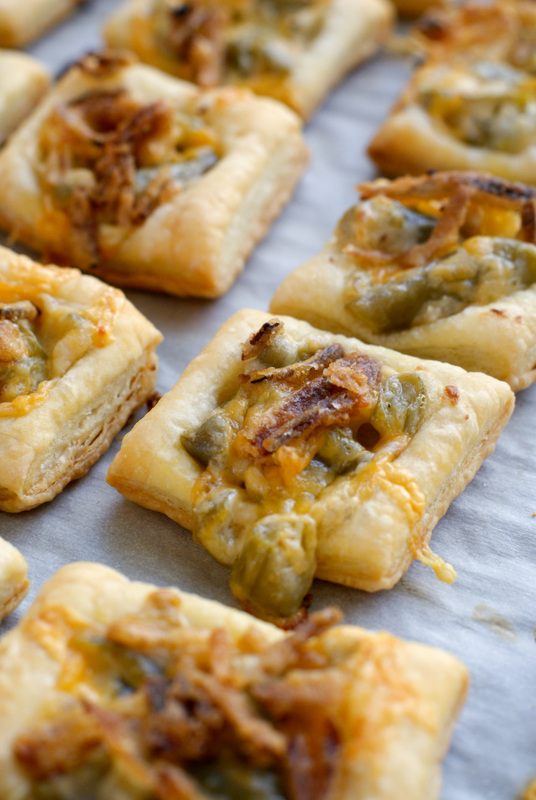 Bake in the preheated oven for 7 minutes, remove from the oven and top each square with a few french fried onions. Return to the oven and continue cooking for an additional 6-8 minutes, until the pastry is puffed and golden. Let sit 5 minutes before serving. This post is sponsored by Libby's. All thoughts and opinions are, as always, 100% my own. These are amazing, just love the idea. I bet they would be the first to go. When do you add the sugar? Thanks! You add it in step 4. I edited the directions!